That Hoarders Smell | Just Me With . . .
Once again, you are a total home improvement super hero. TLC should make a show about YOU. Aw thanks, but they would need to be able to broadcast it in Smell-a-vision. Yea, that’s some serious skin-crawling. Holy good lord. Can’t wait for lunch 🙂 Kidding. 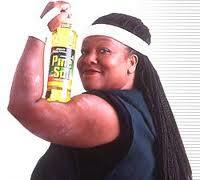 Anyway, GO YOU for getting this smell out. I can’t imagine the amount of elbow grease that must have required. I so feel your pain. I’m constantly fighting and desperately need help with a similar problem. Unfortunately, my husband and I live with my mother in law who is disgusting and her room has “that” smell, sans the cat pee and feces, but with a constant barrage of human pee and feces, more nastiness and NO bathing (she takes a bath once a year if we’re lucky). Since she is female that automatically means an added smell that is enough on its own to make anyone gag. Combine that with the gross old women’s perfume she adds to the mix and it’s impossible to even be in the same room/car with her. Multiple people have lovingly approached her with the issue and she doesn’t care one bit how detrimental to her health it is or how miserable she’s making everyone around her. Anyway, we’re stuck here for now so we just try to keep the smell down because it makes the rest of the house stink, which we work very hard to keep clean and odor-free. I’ve tried everything to make her room stop stinking up the rest of the house. She freaks out if she even thinks we touched or moved anything in there so we can’t just empty it and clean it like it needs to really get rid of the smell. We have cleaned it for her several times in the past and she just piles it right back up within a few weeks. There’s a path around the bed to the bathroom and that’s it, the floor is barley visible and only in spots where I’ve picked up items that I know are just trash like food wrappers and bags and things, and even the bed is piled 4-5 feet high except for the spot she sleeps. I go in there every few days and bleach every surface and wall I can get to and spray it down with lysol and various other products to try to keep the smell at bay, but nothing helps for more than an hour or so. If anyone can recommend products or other ways to keep the smell down until we can get out of this house, PLEASE let me know asap!!!!! Surely there is a product that absorbs horrible smells in crime scenes or hospitals or something that I can leave in there or spray in there, right? Thank you everyone! Oh you poor thing. I don’t know what to tell you. My hoarders had left but you have an ongoing situation. Can you sneak stuff out and wash it and put it back? Or, maybe use sealant around the door to keep the smell from coming into the rest of the house, you know how people weatherproof doors and windows? Do it on the inside door to keep the smells out. Do you have carpet and curtains throughout the house? Maybe decrease the amount of cloth in the house, anything that holds smells. Ugh. I hope your situation changes soon. There is a product called Consume (by Spartan Chemical Company) that is made for this purpose. It worked wonders on one of my rental properties. Go to a commercial cleaning supplier to purchase it. Great post! Good to hear that you can turn a disaster into a loving home. 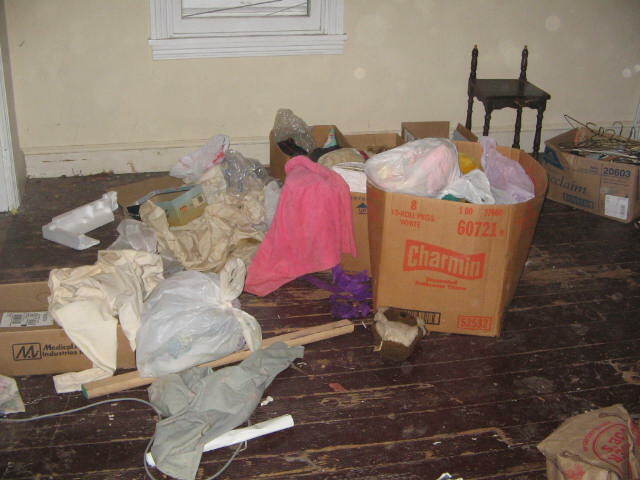 We found this post after thinking about buying a hoarders house. You give us hope that it might work out. Thank you. 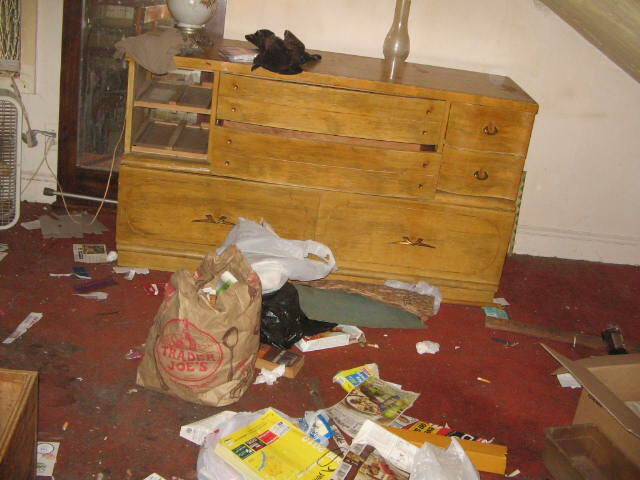 Hoarders houses make for great before and after pictures. I wish they could come in smellavision. Good luck. Can’t beat the price of hoarder’s houses either. Did you not see the inside of the house before you bought it? I did see it. 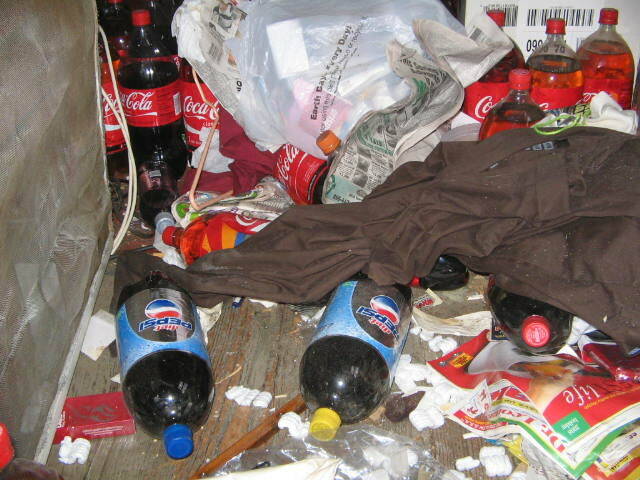 But it was Fall so the smell wasn’t quite as bad, it was so filled with stuff I couldn’t see the piss or water damage, or some walls, closets were completely full — like on Hoarders. I never could see the floor in some rooms. Didn’t actually see the floor or walls until after they moved out. I was an “as-is” sale on the only house I could afford and keep my kids in the same schools. Other people interested in the house never got past the front room (which was the least smelly). Even with all that, there was a bidding war for the house, because of the schools. They had a lot of things hanging to keep out bad spirits. Weird. Congrats on getting that cleaned up. I’m sure your house appreciates you for that, Iin return it will keep you safe and warm. Thank you. Yes, the house needed the TLC. I think the neighbors appreciate it as well. I’ve had strangers stop and compliment it and I appreciate it so much. Once even the pizza delivery person said how different the house was inside. I’m not sure but I think she was talking about the smell. I also talked to a woman who thought about buying the house but when she walked in and saw the cats and the smell she just walked out. She didn’t even go all the way inside. The smell was bad, really bad. I rented a scary little house to keep my kids in their same schools. Later when I started dating the Good Man, he noticed the electrical wiring hazards I hadn’t…and when my landlord thumbed his nose at me, Good Man fixed the electrical. Your oil-based paint is a Brilliant solution. My friends has more money to deal with their post-hoarder home, and gutted it. I wouldn’t have been able to do that. Thanks, nothing like a five year old typo!! haha Now I’ll want to proof everything again. Thanks for reading and commenting. I looked at another fixer recently. I real mess, but it didn’t sell, so I was like — cool! Just Me…. My mother left me a trailer with add ons in CA…. Awful.. same condition, roof leaked, 12 cats in house, dog in house and Urine feces all over. 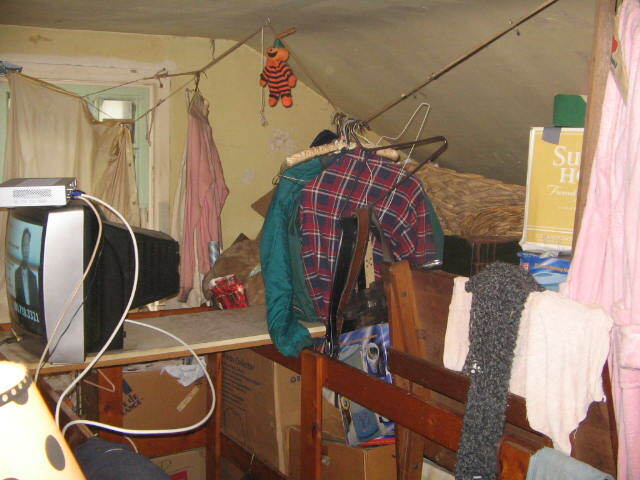 Not to mention a true hoarder, not a space avail from ground to 4ft, except walk way. I had no idea as my mom would not let me come over. She passed in July 2015 and still I have not gotten anything done .. only child and just finished with probate!! Now I want to basically give this trailer away… for price of Land 5900.00 in Salton Sea CA. Any suggestions ? Im afraid to even put on market. I live in WA. I know this is many years later, just happened to see this post… and it’s spot on!!! Anyway, thank you so much for all of this. My parents have been hoarders/ had hoarding tendencies to varying, but ever increasing, degrees since I was very young (I just turned 37 last month), and probably before. 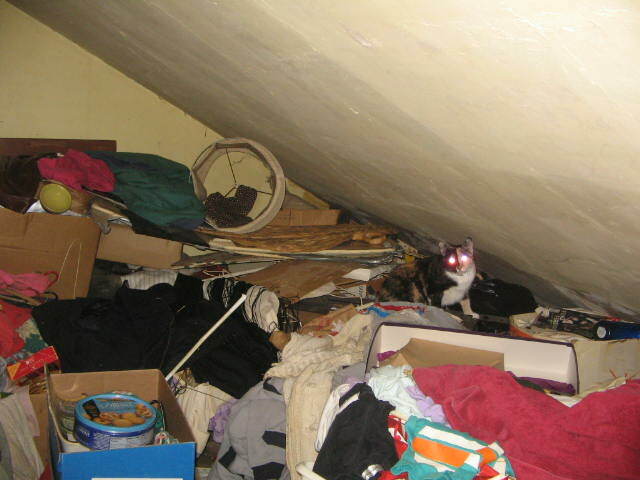 In the years since the kids have left and Mom and Dad’s house has gone drastically downhill, beyond just disorganized and junky, to the point of their multiple cats taking over and destroying carpets and letting the stench of their urine and feces permeate every pore of their home’s comprised materials. It’s actually not as bad right now as it had been several years ago when the only trash/waste management company servicing their rural area took advantage of their ability to charge whatever they wanted without being checked by competition, which led to my folks’ inability to afford having a service haul away ANY garbage for several months at a time, including the used kitty litter their four cats went through. They would burn what they could in a barrel out back, and just stack up and store old kitty litter pales with used kitty litter IN THEIR HOME. This has, of course, had a lasting effect. At that point in time, just being in the house and breathing in almost straight ammonia for 20 minutes or more would leave me with scabbed over burns in my nostrils. About ten years ago when they went out of town and asked me to feed their pets and give one cat the insulin injection he needed every 12 hours to live, I hauled off the entire cache they’d amassed and not long after instated an unspoken policy of no longer entering their house, for the sake of my own physical, mental and emotional health. I can’t fathom how they’ve managed to live in these conditions for so long. It ties my stomach in knots to think of what this has done to their health, never mind all the heartache and sleep-stealing anxiety that comes from just knowing they live in such squalor and think they deserve that kind of existence.